Nadia Petrova committed 47 unforced errors compared to 25 winners during her bout with Svetlana Kuznetsova. 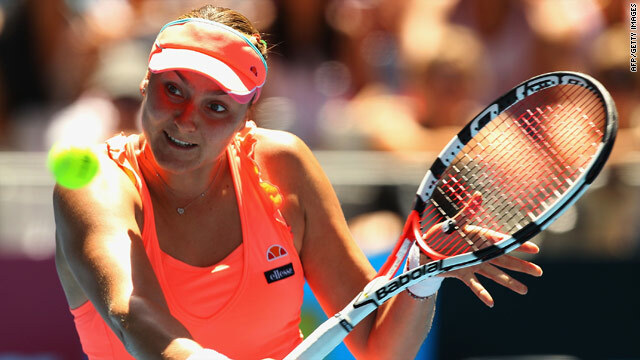 (CNN) -- Russian Nadia Petrova on Sunday upset one of the Australian Open tournament favorites after beating compatriot Svetlana Kuznetsova 6-3, 3-6, 6-1. No.3 ranked Kuznetsova committed 52 unforced errors compared to 22 winners, while Petrova recorded 47 and 25 respectively. "I was struggling with finding my rhythm the entire match," Kuznetsova told the Australian Open Web site. "I give credit to (Petrova). It's the best I've seen her play last two years I think, but I didn't deserve to win because I was not playing good enough. I had too many unforced errors and didn't serve good." On Saturday, defending champion Serena Williams cruised into the fourth round after a comfortable win over Spain's Carla Suarez Navarro in straight sets. Clijsters, who stunned the sporting world with victory at the U.S. Open in September three tournaments into her own comeback, was one game away from a whitewash defeat by Petrova in her worst result as a professional. Petrova will now play Henin, who fared better than her compatriot Clijsters on Friday but had to dig deep before beating big-hitting Russian 27th seed Alisa Kleybanova 3-6 6-4 6-2.